The oceanographer was accidentally discovered luminous sea turtles while they are researching and filming the lives of small sharks and coral plants in the Salomon islands, South Pacific. 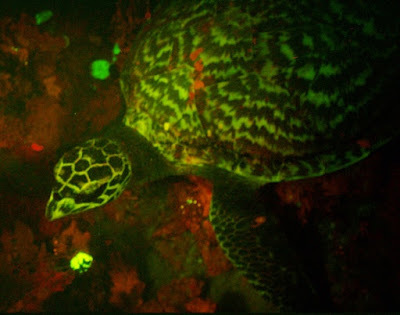 The scientists succeeded in filming a Hawksbill sea turtle that emit red and green neon colors. The discovery was made last July by David Gruber of the University of the City of New York with the team. The new recording they announced to the public, on Monday, September 28, 2015 last. Gruber described the alien ship sea turtles like the first time he saw it. "He was so unbelievably beautiful," said Gruber told CNN on Wednesday, September 30, 2015. The turtle swam toward us when the team was focused to record coral. His arrival was so sudden and surprising our team, "he said. In recent years, experts became interested in marine habitats biofluorescence, or creatures that absorb light and emit light it again with a different color. "It's like a mystery novel," adds Gruber. "Starting from jellyfish, corals, and jellyfish and corals glow that made the breakthrough in marine biomedical field. The problem is, corals and jellyfish simply removing one color, while the turtle can be issued more than one color." Fluorescence has helped provide a marker for scientists to see cells in the body and lead to groundbreaking research in the field of biofluorescence, Gruber explained. Find reptiles that can emit light brings the question, why turtles could glow? What exactly is the chemical components contained therein. It is the privilege biofluorescence. So far there are 200 species of sharks and fish were found to be able to process it. In some cases, the experts concluded, corals can perform this process because they absorb sunlight. But for fish and sharks, from where they get light and how it could not be ascertained. "Fish and sharks are still a mystery to us. Now the sea turtles. This is an example of how the ocean still holds many secrets," Gruber laughter. Hawksbill sea turtles are endangered species and threatened by climate change. In many areas, the only remaining thousands of females who actively reproducing.